When Michael Dell, head of Dell Inc. revealed he struck a massive deal this week to take the company private; the entire business world was in shock over the numbers involved with this ground breaking deal. As the biggest leveraged buyout since the financial crisis first hit, Dell’s deal, which will have the company partnering with the Silver Lake private equity firm and Microsoft Corp, has taken the company a long way from its humble beginnings. The record-breaking deal was agreed upon in an effort to take the powerhouse company, which began in a college dorm room, and turn it around without the pressures or feedback from Wall Street. After 24 years in the public market; the company which was once at the top of the personal computer realm, needed a massive change and that change came in the form of a $24.4 billion deal. After nearly a decade spent falling off their pedestal, the executives needed something that would put an end to their floundering; and according to Michael Dell and his team, this was just what the company needed. According to reports involving the heavily scrutinized deal, Dell executives are still planning on sticking to their original expansion strategy from before the deal and will look to expand their software and computing services to large companies. The new movement for the company has many assuming that the focus on entering their corporate market and for becoming a full service provider for large companies will have Dell abandoning their low-margin personal computer business which first helped them rise to the top of their market. However, Dell is keeping quiet on whether or not they have plans to abandon the personal computer sector and they are keeping quiet on what they will be doing differently as a private entity. Although there are many shareholders who are demanding more information and some who are claiming insider trade, there are others who believe this move is inevitable due to the recent decline of Dell’s share of the market. Although the numbers surrounding the deal have had many in shock as the 11th largest buyout in history moves forward; many are still focusing their attention on the man at the center of the deal. 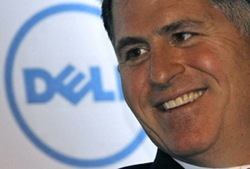 After a hiatus from the CEO position, Michael Dell returned to the company in 2007 to attempt to turn Dell around. However, his attempts never gave Dell the boost they were looking for. This means now the company simply needs to hope that this new foray into the private sector will give the once high reigning company the edge it needs to regain its prominence in the market.